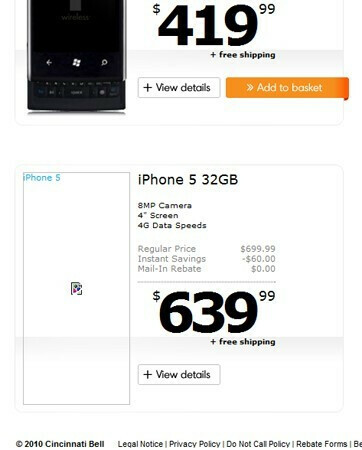 A screenshot of the Cincinnati Bell web site shows that the regional carrier is preparing for the introduction of both the Apple iPhone 5 and the iPhone 4S by using placeholders on its site. The Apple iPhone 5 shows up as a 32GB model with an 8MP camera and 4G data speeds. While it is not expected that Apple will deliver an LTE enabled iPhone this year, as we reported, a slide showed by China Unicom last week made reference to the Apple iPhone 5 having 4G connectivity through an HSPA+ network, which AT&T does offer. The price of this "Apple iPhone 5" shows as $699.99 with a $60 rebate bringing it down to $639.99. Cincinnati Bell apparently believes in the rumor that Apple will deliver an iPhone 4S with slightly improved specs. The placeholder for that phone shows a 16GB model with a 3.5 inch screen, a 5MP camera and an A5 processor. The price shows up as $400 before a $300 rebate brings the price to an incorrectly posted $99.99. Of course, it all is a moot point anyway since the copy and the pictures are just placeholders, awaiting pictures of the real devices and real copy. The fact that Cincinnati Bell shows both an Apple iPhone 5 and an Apple iPhone 4S could be a guess or a response to some information that the carrier knows about. 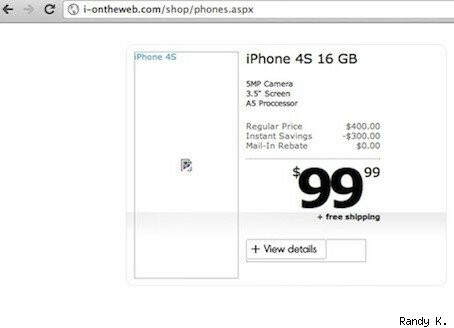 Our earlier story about Radio Shack's inventory system featured a screenshot that showed only the Apple iPhone 5 although the photo did show that AT&T, Verizon and Sprint would be offering the device in the States. On the other hand, a web site called MacPost says that references to the Apple iPhone 4S only are found in the iTunes beta version and is tagged with an image of a CDMA iPhone 4 indicating that the design of the iPhone 4S might closely follow the current Verizon variant of the Apple iPhone 4. With no mention of the GSM model, the Apple iPhone 4S could be a dual-mode device. We have heard so many different stories about what Apple will be announcing that whatever Tuesday brings, it will be a relief to those who have been following this process from day one. wow this is good. Im considering to buy that 4s . of course after buying a GSGII. then I ll have the best cpu with android and the best cpu with iOS. 4" screen!? I actually may consider this phone. The good news also is that we should be able to assume that the new Iphone 4S and 5 will work on T-Mobile 3G network. 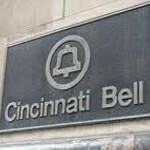 The are only 2 carriers here in the states that use the 1700 frequency band Cincinnati Bell and T-Mobile.